(CNN) -- A United Nations court convicted a former governor of Rwanda to life in prison for his role in a 1994 genocide that left about 800,000 dead in the central African country. 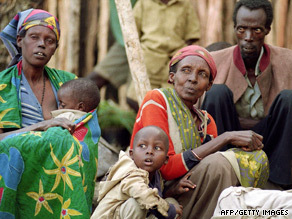 An estimated 800,000 people -- mainly Tutsis -- were killed in Rwanda in 1994. Tharcisse Renzaho was found guilty of genocide, crimes against humanity and war crimes. The verdict, delivered Tuesday, is the third judgment on charges of genocide delivered this year by the International Criminal Tribunal for Rwanda (ICTR). The U.N. court is holding hearings in Arusha, Tanzania, where it is based. Renzaho was governor of the capital, Kigali, and a colonel in the Rwandan Armed Forces in 1994 during the country's genocide, when extremist militias made up of ethnic Hutus slaughtered ethnic Tutsis across Rwanda. It began in April of that year and within 100 days, an estimated 800,000 people were killed. The court found that Renzaho ordered soldiers, police and militias to set up roadblocks to identify Tutsi civilians to be executed. It found he ordered the distribution of weapons to people who then killed Tutsis. Renzaho also supervised a selection process at a refugee site where about 40 Tutsis were abducted and killed, the court found. Renzaho participated in an attack at the Sainte Famille church in which more than 100 Tutsis were killed. People across Rwanda sought refuge in churches all over the country as the genocide unfolded. He also made remarks encouraging the sexual abuse of women, according to the court, and was found criminally liable for the rapes that followed. The genocide ended when Tutsi-led militias backing Rwandan President Paul Kagame ousted the Hutu government supporting the massacre. Renzaho was arrested in September 2002 in the Democratic Republic of Congo. His trial began in January 2007 and closed in September that year after hearing from 53 witnesses, including Renzaho. Throughout the trial, Renzaho maintained his innocence and said he had no association with the militia. Renzaho's lawyer blamed the case on political interference by the Rwandan government. Renzaho has the right to appeal the verdict. The decision is the third judgment on charges of genocide delivered this year by the tribunal. Emmanuel Rukundo, a former military chaplain, was convicted of genocide and crimes against humanity and sentenced to 25 years in prison. The court found Rukundo had a history of contempt for Tutsis and his fellow clergymen, and that he ordered the killings of Tutsi civilians. Callixte Kalimanzira was sentenced to 30 years in prison for genocide and incitement to commit genocide. The court found that Kalimanzira, a senior civil servant who at one point worked with the Interior Ministry, participated in various massacres of Tutsi civilians and actively encouraged other crimes against them. Prosecutors at his trial said he beat some Tutsis to death and called for the elimination of all Tutsis, including pregnant women and their babies.